Pesticides are composed of toxins that are designed to prevent infestations. Pesticide exposure may result in chemical-related injuries and illnesses. Workers who mix pesticides or apply pesticides to crops are particularly at risk for injuries arising out of exposure to direct spray or residue. Their families may also be exposed to residue on the skin or clothing of a loved one. Pesticide exposure on the job presents a risk of acute or chronic illness, as well as negative effects like rash, irritation, dizziness, and nausea. People who are suffering adverse affects from pesticide exposure should consult a Boston workers’ compensation lawyer at Pulgini & Norton. In some cases, a single exposure to pesticide may result in poisoning and acute effects, such as dizziness, vomiting, or headaches. Moreover, long-term effects of pesticide exposure may include cancer, reproductive problems like infertility, hormonal imbalance, neurological disorders like Parkinson's, and other chronic conditions. If you become sick as a result of pesticide exposure on the job, you may be eligible for workers' compensation benefits. These benefits include medical treatment, vocational rehabilitation costs, and varying degrees of disability pay, depending on how disabled you are by the exposure. Someone who suffers an acute effect of pesticide exposure may simply need medical care. However, someone who is exposed to pesticides on a daily basis and develops a serious illness may be disabled and require significant time off. In some cases, it may be necessary for a worker to receive permanent total disability benefits, which may be paid for the rest of the worker's life. There are no time limits to this type of benefit. Some features of total disability include a disabling condition that may continue indefinitely. 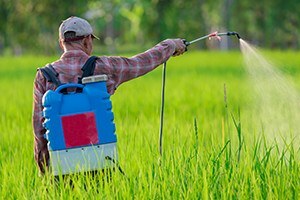 If you have a pre-existing condition or other risk factors for a serious illness that you believe was caused by pesticide exposure at work, you should bear in mind that multiple factors may be the cause, and as long as some aspect of your job was a major cause of your disability, you can recover benefits. When pesticide exposure results in a serious illness that leads to death, it may be possible to receive death benefits. These are benefits that may be collected by a decedent's surviving spouse or children. They include a maximum of $4,000 in burial expenses and weekly benefits that equal two-thirds of the deceased worker's average weekly wage, up to a maximum sum set by the Commonwealth. Surviving spouses may receive death benefits as long as they are dependent and do not remarry. If a surviving spouse marries again, each eligible dependent child is still entitled to $60 per week, although the total weekly amount paid to dependents may not be more than what the spouse received before remarrying. If you suffer an illness due to pesticide exposure on the job, you are likely to need medical care and time to recover. You should not hesitate to enlist a Boston workers' compensation attorney to fight for the full range of benefits to which you may be entitled. The work injury lawyers at Pulgini & Norton represent claimants in many Massachusetts cities, including New Bedford, Waltham, and Quincy. Contact us online or call 781-843-2200 for a free consultation.